Available in a wide variety of rich fragrances at great value. Can be easily placed anywhere in the home for continuous, long-lasting freshness. Simple to use solid air freshener with no outlets or batteries needed. 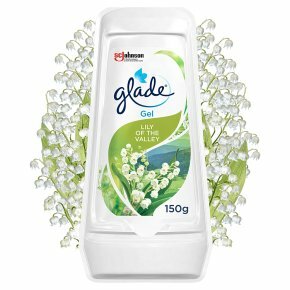 Adjustable gel air freshener cone allows you to release just the right amount of fragrance for your home.Meet the Glade Solid Air Freshener ? just twist to release the rich fragrance within and set the intensity by adjusting the lid. With a variety of scents to choose from, it's the perfectly practical way to add continuous fragrance to your home. Let the floral scent of magnolia blossoms treat you to the best day ever. Bright and bouncy with a touch of vanilla, it?s the scent of a joy you can?t deny. Warning<br>Keep out of reach of children.